The Canadian Ski Patrol is honoured to announce that Her Excellency the Right Honourable Julie Payette has confirmed her viceregal patronage. The Canadian Ski Patrol has enjoyed excellent relations with Rideau Hall dating back to the 1960s, when His Excellency the late Right Honourable George P. Vanier served as the first patron of the CSP. Before becoming Governor General, as an astronaut Ms. Payette completed two spaceflights. She served many years at the NASA Mission Control Centre in Houston, Texas, and was the chief astronaut for the Canadian Space Agency. Ms. Payette is well respected for her work in promoting science and technology. She has served on the boards of several organizations dedicated to technology and young people. 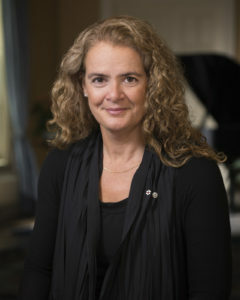 In her role as Governor General, Ms. Payette keenly promotes a healthy living and active lifestyle for all Canadians. She represents the government of Canada abroad, and is the representative for the Sovereign, Her Majesty Queen Elizabeth II, in Canada. She serves as commander-in-chief of the Canadian military and has a number of constitutional responsibilities that ensure Canada maintains a stable and vibrant democracy. For information on how the viceregal patronage can be used by the CSP, please contact Greg McCormick, VP Brand and Partners.